A hobby greenhouse helps extend the growing season. The heat and humidity held in a greenhouse allows gardeners to start seeds early and to hold young plants in containers until the weather outside has warmed up and the plants are strong enough to be transplanted. While a hobby greenhouse will not keep in enough heat in the dead of winter (depending upon your zone), technology such as grow lights and heat mats are not necessary if starting plants in a well-maintained greenhouse in the spring. Start plants from seed in a greenhouse. Choose fresh seed packet labeled for the current year--never use old seeds. Start seeds about a month before the last frost is expected in your region. Read the packet of seeds, however, for more specific information. Use a high-quality potting soil mix. Good potting mixes will both feed plants and have adequate drainage. Use a tabletop greenhouse tray and seed-starting cells, but you will not need to purchase the lid of the tabletop greenhouse if you are starting seeds in a hobby greenhouse. Place pea stones or broken bits of ceramic plant pots (if you have broken pots already) in the bottom of a seed starting tray to aid drainage. Don gardening gloves, fill the cells with potting soil and add seeds. Water the cells by using a spray bottle. A greenhouse holds in humidity and over watering in a greenhouse kills plants. 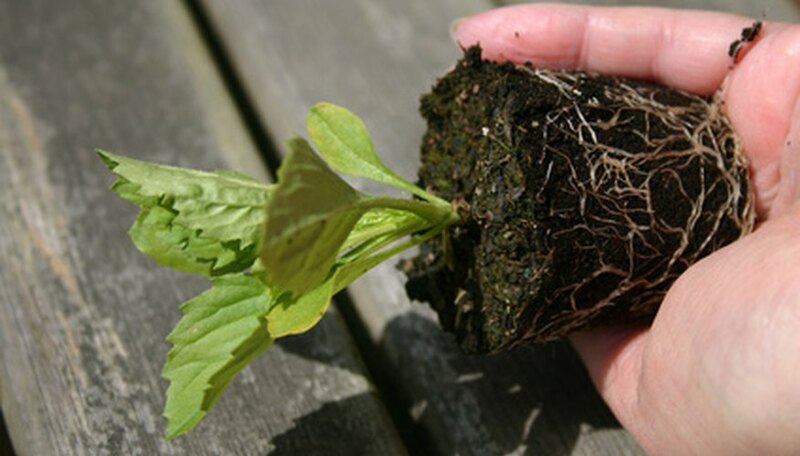 Check the seedlings every day and if the soil feels dry, water them. Do not water wet soil. Skip a day when the soil is wet. Label the trays of seedlings. It is easy to forget what you have planted where. Write the name of the plant on wooden plant marker stakes with a permanent pen and place in the tray. Allow the plants started in a greenhouse to get big and strong before transplanting. Wait for true leaves to show (usually the third leaf is a true leaf). Soak clay pots in water for ten minutes before transplanting seedlings. Keep these seedlings in the greenhouse. Harden plants before transplanting outdoors by placing them outside during the day and bringing them back into the greenhouse at night. Do this for a couple of weeks.